17 fascinating selections to help you better understand our universe (and other worlds). 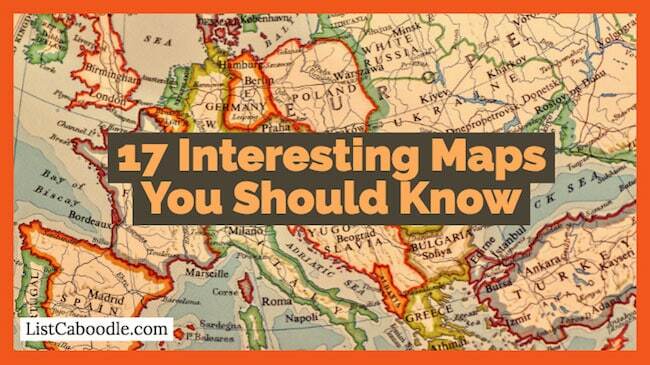 Interesting maps play roles in a wide variety of areas in our lives. A geographical one might be the first that comes to your mind. However, there is a world of different types out there, including many that you may never have heard about. Whether you are a gamer, explorer, student, or a religious person, you can find a wide range of varieties of interest. Here are 17 interesting selections that you should learn about. They help us understand spacial relationships, scale, and history. Google updates images roughly around every couple of weeks. Users are allowed to report images for the team to review them. They automatically blurs identifiable information such as license plate and human face. The Street View technology allows you to view inside museums in the United States, UK, Canada, France, Australia, Ireland, Netherlands, and New Zealand. Currently, Google uses camera systems that can produce 65 MP images for these. These aren’t based on any mathematical projection. The author George R.R. Martin drew all these, except one. The mountains in these were drawn based on the Andes mountain range in Argentina. The King’s Landing features 3 big hills and is rectangular like Manhattan. The Journeys map displays every character’s path. Initially, there were claims that these could be infinite in their span. Even though there are no hard limits, they can become buggier after certain points. Get a view from top of the Mount Everest. Look at sites in the past using the time slider feature. See where Outlander’s Jamie and Claire sleep in Scotland. Learn flying basics such as using the rudders, flaps, and ailerons through a built-in simulator. View planets in the night sky and study constellations. Study the effects of climate change. View famous buildings and landmarks in 3D model. You can also view these in 3D, visit the rain forests of Brazil, and also keep track of cruise ships. There are hundreds of satellites that keep capturing images of the planet Earth. They are used to create different types, many of which can be easily accessed by people using a web browser or app. There are several services that allow you to look at these. Google Maps and Google Earth are two excellent examples. While Google’s can be accessed via a browser, you will have to download Google Earth to your computer system to view the 3D version of the globe. Satellite options are available not just for earth, but for other planets and the moon as well. Everyone has seen these in their geography classes. They can be of political or physical types. Many feature countries with pthat emphasize the territorial boundaries of nations. This type shows governmental boundaries of nations, states, counties, districts, and cities. They use different colors to help you differentiate between different countries. These show larger bodies of water as landmarks. For example, rivers and coastlines are often part of the political border. Political cartograms are perhaps the first types that you will come across during early education. They help you in understanding the concept of countries and states. Atlas, globe, or wall versions are excellent examples that help children understand territorial borders using bold and bright colors and outlines. Zillow is a popular real estate marketplace and Zillow make it easy for sellers and buyers to find each other. These tools enable listing agents or owners to edit their building’s location. The map uses multiple information sources for cross reference. The accuracy of these is based on the accuracy of the information you provide about your home and neighborhood. Single point in search results. House address and street location. The Legend of Zelda video game series is one of the most popular game franchises and features maps that you can explore. Most are Overworld and Dungeon versionss, but you can also find additional ones. Initially, the they were meant for navigation purpose, but they became more and more elaborate as the series progressed. You can find versions in all the games in the series, except a few. Some provide a layout of the world or a Dungeon. They can also sometimes show the current location of the protagonist, Link. They are usually blank until you explore the area. Brain maps, based on brain mapping, allows researchers and doctors to understand the structure and functions of different brain parts. It uses a series of neuroscience techniques that involves mapping of biological features and spatial representations to create the tool. It involves neuroimaging, data processing, and the study of brain region behavior. They help in relating the brain’s structure and its functions (such as vision and sound). Scientists have also identified brain parts that can detect objects of different colors. They can also help study the impact of aging process, learning, and other external factors on the brain. They can be structurally similar to what Google Earth can do for the Earth. If you are a gaming enthusiast, you should know about Zombie Chronicles. The Zombie Chronicles is the 5th DLC map pack for the award winning video game, Call of Duty: Black Ops III. There are 8 unique zombies funny maps from previous editions of the game franchise. All of these have been redesigned for the Black Ops III series. The game has different ‘mechanics’ from the previous versions, thus most of the weapons have also undergone changes. Forehead: Acne on the forehead can be related to problems with the digestive system, liver, sleep problems, or stress. Cheeks: Pimples on the cheeks are caused due to pollution. It may also be caused if you are taking excess sugar. Between the Brows: Acne between the brows may be due to consuming greasy foods or excess alcohol. Chin: Chin pimples are caused due to hormonal changes. These work as a common language that can be used by students and teachers. They make it easier to memorize the notes. TV Food Maps is a mobile application that helps you find the ideal restaurant. If you come see a perfect restaurant on TV with mouthwatering food, you can find it using this app. It covers all the popular TV food shows including Diners, Man vs Food, and Drive-Ins & Dives among others. It helps you choose from over 5000 restaurants and 48 TV shows. Find restaurants on your road trip. Filter searches based on many factors including popularity and TV shows. Get automatic alerts based on restaurant proximity. If you have a deep interest in theology, you might know about the geography of the biblical areas. Understanding the geography helps give you a deeper understanding of the bible’s messages. You will find interesting events on these chartss, including the Life of Jesus, the Apostles, and the Journeys of Paul. It can be almost impossible to learn about the ancient places without the terrain map. You might find it interesting that selections in the bible have the Dead Sea area in Israel as the deepest land trench on the planet. As the name suggests, weather maps provide you detailed weather information for a region. These were first created in the middle of the 19th century. They show a wide range of meteorological information over an area at a given point in time using different symbols. They are also useful in weather forecasting. Some can show multiple data types to help you gain complete information on the weather conditions. These are more commonly found in fiction and are mostly represented by hand-drawn features representing the terrain. However, they are not specifically restricted to pirate maps. Any map that can represent a treasure location can be called one. Thus, there are different references to these versions and they can be related to pirates, copper scroll, El Dorado, literature, and film. WiFi Map is a crowdsourced application that helps you find Wi-Fi hotspots around you. It is based on a collaborative community, the largest of its kind in the world. The app can help you not just find hotspots, it can also provide you passwords to protected networks. All community members help each other by commenting network passwords. You can also add networks to the community. The map will show you all private and public WiFi networks near you, no matter where you are located. It covers over 100 million WiFi networks all over the world. It also supports navigation, making it easy for you to locate networks. Besides, it is also supported by social media sharing options. So these are 17 versions for you to examine, explore and understand.